The best feature of the 18F4550 is the built in (full) USB interface. The 18F4550 is similar to the 18F2550 in that its main outstanding feature is that it has a built in USB interface. Again because it is an 18F series device it is optimized for C programming and has a 31 deep hardware stack and linear memory (no banked memory). The PIC18F4550 has 16k of program memory and 2048 Bytes of RAM (linear RAM) - these are the same sizes as the 18F2550. It is packaged in a 40 pin DIP and other packages are 44pin QFN and TQFP (for surface mount) and as usual it can be programmed in circuit using ICSP. In common with other 18F series devices there is a built in 8 by 8 bit hardware multiplier (8x8). 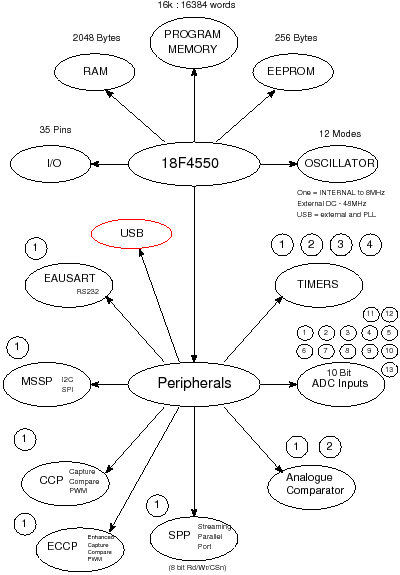 In the same way as the 18F2550 you can enable the internal oscillaltor PLL to create a clock that is a multiple of the input frequncy for use as the system clock - the maximum clock speed is 48MHz and the instruction cycle is Fosc/4 so the maximum MIPS rate is12MIPS.